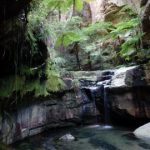 The 32 klm Thorsborne Trail explores the east coast of one of Australia’s largest island national parks. 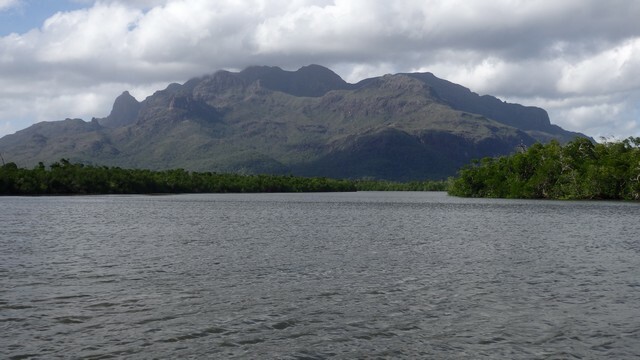 Hinchinbrook Island east of Cardwell, is nearly 40,000 ha of national park and forms part of the Great Barrier Reef Marine Park. 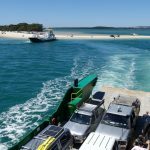 After boarding our small seagoing vessell at Cardwell, Tania & I embarked on the 45 minute voyage to Hinchinbrook Island. 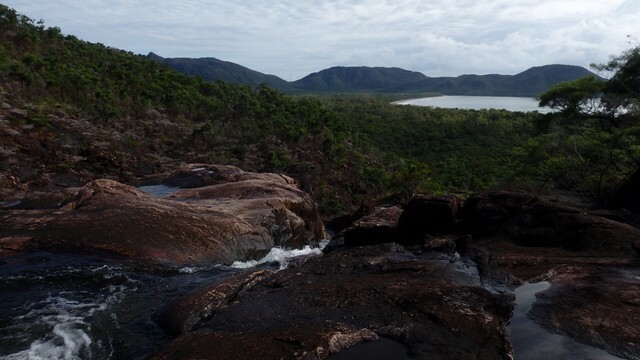 Viewed from the Hinchinbrook channel, the scars from Cyclone Yasi are still visible in the mangrove forest fringe of the island – evidence of the destructive path carved one February night in 2011. 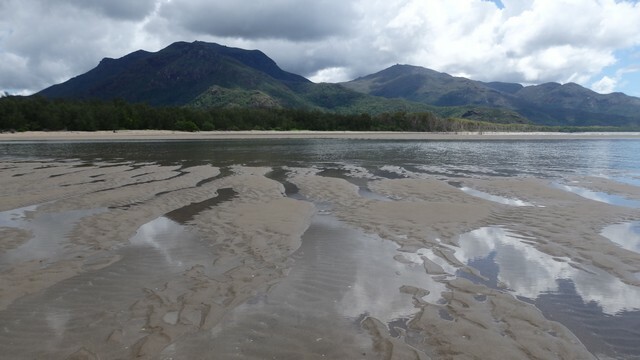 Our boat passes over a sandbank once covered with seagrass, now stripped bare, where dugongs once so prolific are now rarely seen four years on. 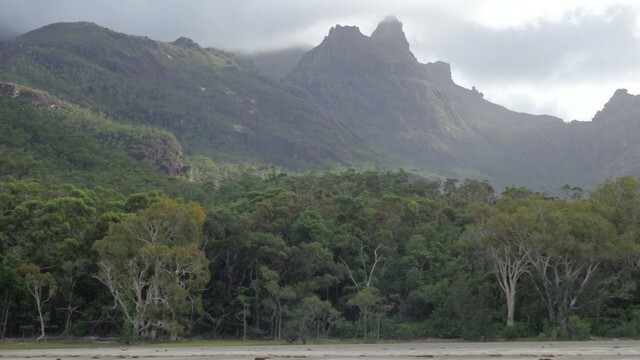 As we cruise through the mangroves, we get a close up view of the towering Mt Bowen. 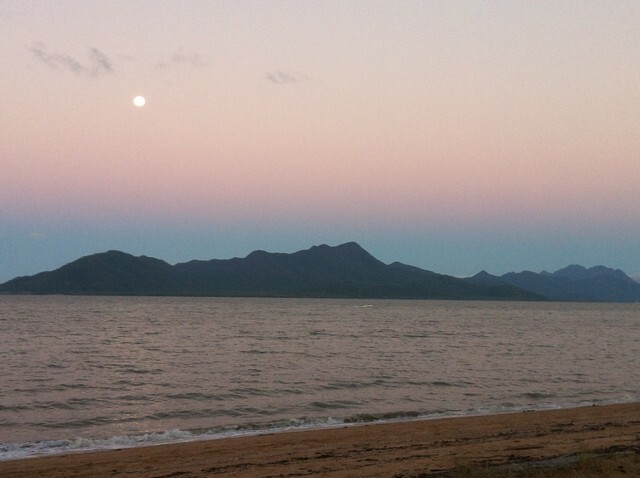 Rising 1121 metres from the Coral Sea, it’s the dominant peak on Hinchinbrook Island, easily visible from the mainland. 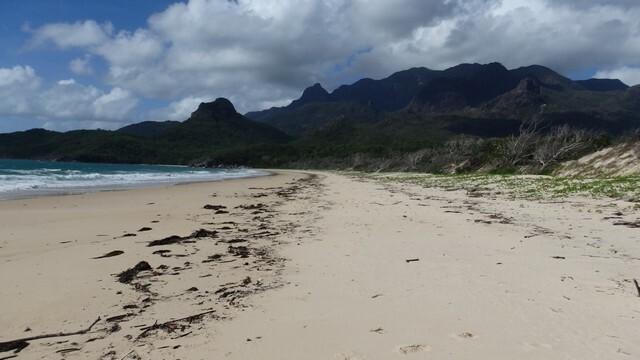 After landing behind the sand dunes at the Southern end of Ramsay Bay, we begin our walk along the beach before leaving the sand to climb the ridge separating Ramsay and Nina Bays. Enroute to Nina Bay we take the side track up Nina Peak. The summit offers one of the best views of the Thorsborne Trail, where one can anticipate with enthusiasm the thought of walking barefoot in the sand of the beaches spread out below. 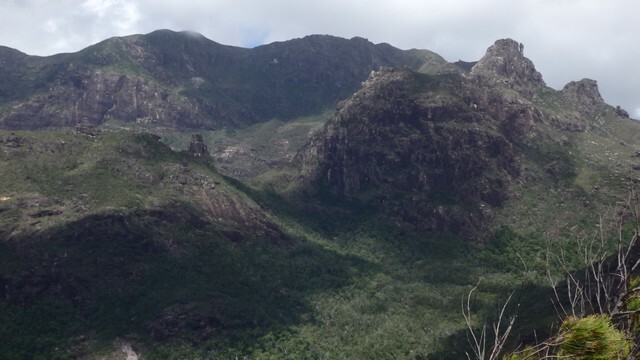 Nina Peak also presents a good opportunity to eyeball possible routes up the adjacent Mt Bowen. Nina Bay does not disappoint; with campsites right on a beach lined with coconut palms, tree branches reach horizontal across the sand begging for a hammock to be hung in the welcome shade they provide. 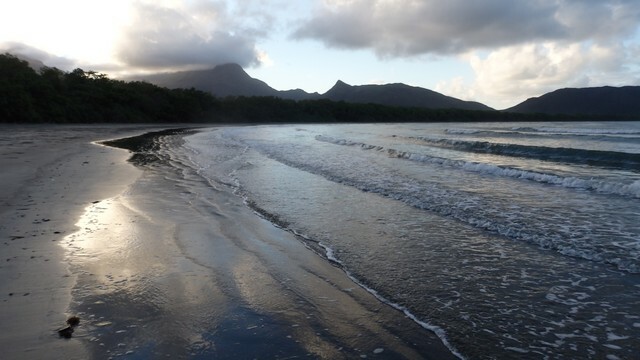 Here we ruminate the day ahead where we will negotiate a route up Mt Bowen – and as the sound of the gentle ocean swell takes me off to sleep, I ponder our chances of success. 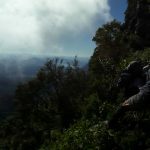 Two days were allocated for our Mt Bowen excursion due to the anticipated challenges. The first being we had no known route to summit; the other was the ever present and at times oppressive early April humidity. Setting off in the pre-dawn light, we set out to follow a creek from its terminus in the sand of Nina Bay to its source high up on a saddle just below the summit. 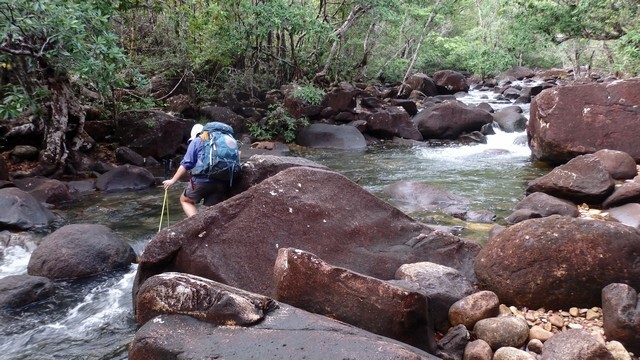 Rock hopping this creek was a highlight of our time on Hinchinbrook Island; with its untold number of waterfalls, cascades and welcome deep waterholes…but progress was slow. Any attempt to exit the creek however, was thwarted by dense two metre high sucker regrowth that made movement even more difficult. It was mid to late morning that the intermittent rain showers started. 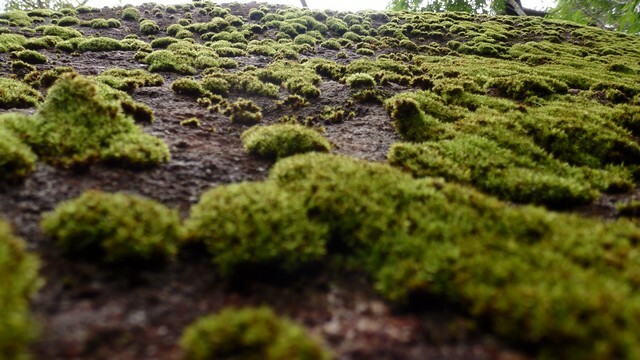 The dry black boulders of the creek, with their patches of moss now wet with rain, were akin to walking on grease. 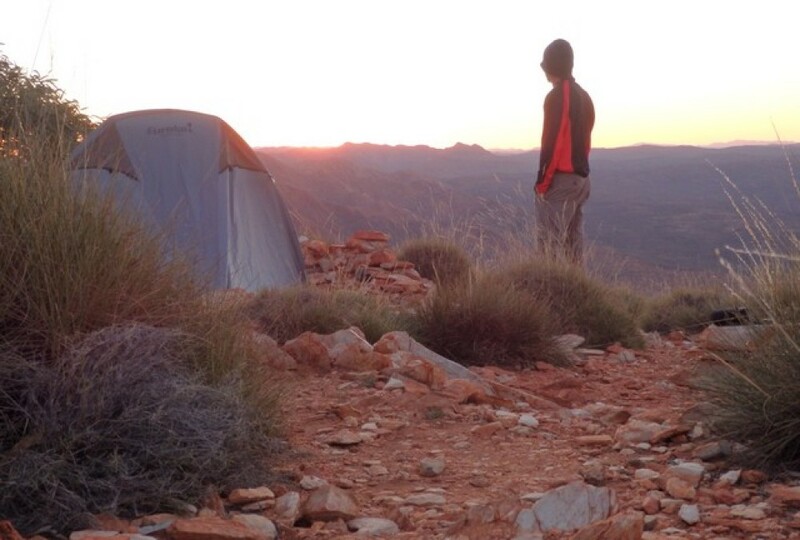 With a successful ascent to the summit looking increasingly slim, we made the reluctant decision to abandon and return to camp. 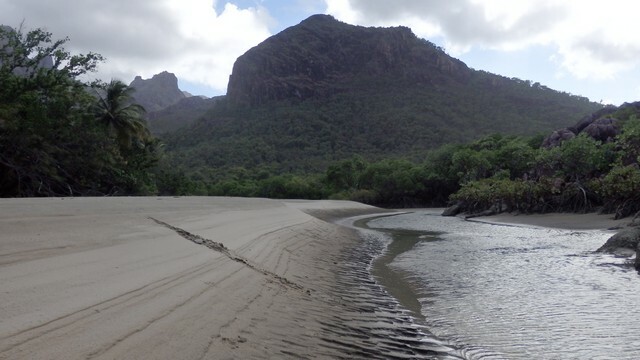 A first attempt failed, but none the less a brilliant day exploring a less seen part of Hinchinbrook Island. The morning begins with a rain-shower. 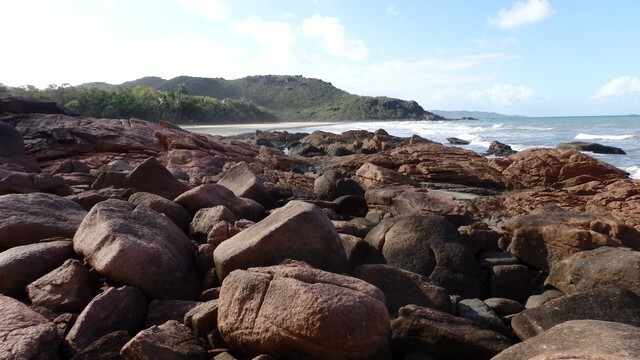 With wet tents now packed we enjoy a morning of walking secluded beaches interspersed with rocky headlands, all the while the imposing monolith of Mt Bowen bears down on us from the island centre – postcard perfect scenery. We are often accompanied by beach stone-curlews that stalk the beach emitting their eerie call and when startled flee on their stilt legs. The ocean is a constant tease under the ever intensifying heat of the sun, however the threat of ancient reptiles with large teeth and painful stingers provided a worthy antidote to my temptation. The Thorsborne Trail eventually leaves the beach and meanders inland to bypass the mangrove swamp behind Zoe Bay. Before reaching the southern end of Zoe Bay, we pass through varied vegetation types including open forest, mangrove and palm swamps as well as lush rainforest. It’s within the rainforest that we have several altercations with lawyer vine specimens of a size and density I’ve never before encountered. Sweating profusely in the still, muggy air of the rainforest, our progress is constantly impeded by their hooked tendrils as they mercilessly claw at skin, clothing and packs. By now it has become apparent also that insect repellant of any form is an essential requirement, with sand-flies and mosquitos launching a fight for supremacy late each afternoon. Another wet morning and tent. 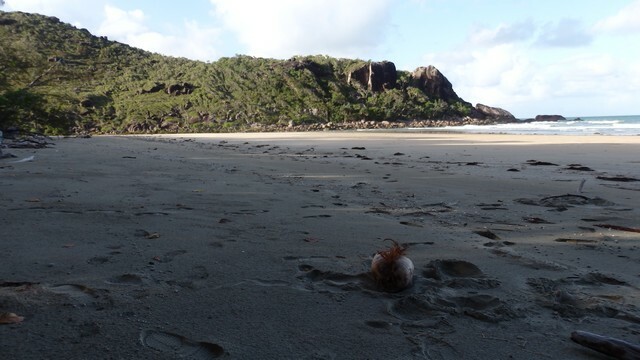 We met a Cape Trib local visiting the island for a few days, who was very adept at opening coconuts. With tree climbing skills far superior to mine, he harvested a breakfast of coconut washed down with the cool liquid inside – beats cereal! 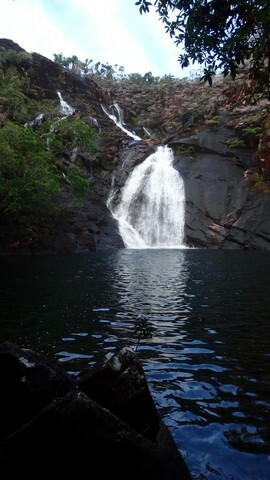 A morning swim at the impressive Zoe Falls cooled us in readiness for the steep climb to the top of the falls and another swim was enjoyed while soaking in the spectacular views over Zoe Bay. 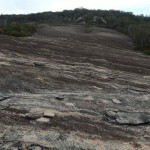 The long steady climb to the saddle, and the highest point on the actual Thorsborne Trail, is through recently burnt out vegetation. 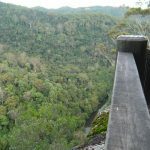 We are accompanied all the while with the constant burbling of South Zoe Creek as it cascades back down to Zoe Falls. 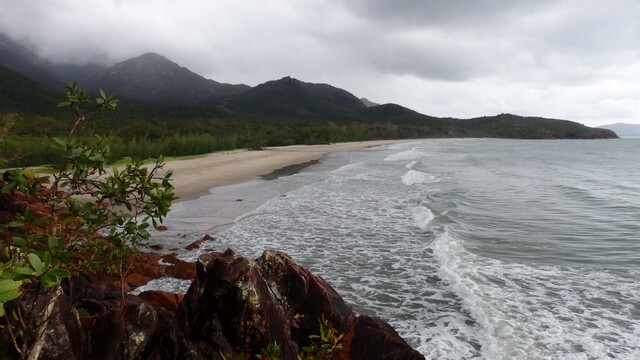 Soon after we reach a high ridge and get our first look at the Southern end of Hinchinbrook Island. 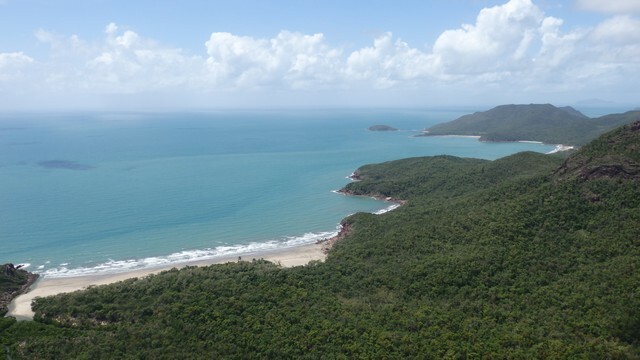 The magnificent vista sweeps from Sunken Reef Bay, to islands further out in the Coral Sea and down to the 5.7 klm Lucinda jetty – the world’s longest sugar loading terminal. This marks our first sign of civilisation as it stretches out from the mainland. My attempt to access Sunken Reef Bay, half hour one way diversion, proves unsuccessful. With the sound of small breaking waves indicating I was tauntingly close to my destination, I was suddenly confronted with a large, stagnant, chest deep swamp approx 10 metres across and as far as the eye can see in either direction. Sunken logs suggested a makeshift bridge probably demolished in a summer storm. It all looked very crocodile friendly and consequently I was unable to muster the courage to take it on and reach the beach. Defeated, I begin the slow uphill trudge back to the trail under the oppressive midday sun. 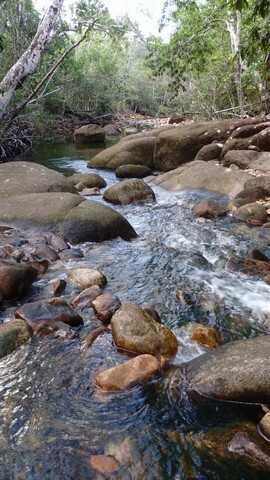 We head on to Diamantina Creek. The wide deep waterway is perfect for swimming and exploring, and is only a short distance from where it flows over Mulligan Falls. Arriving early afternoon and with the sun still dictating terms, swimming in the large waterhole below the beautiful Mulligan Falls is first priority and a perfect location to put the feet up. 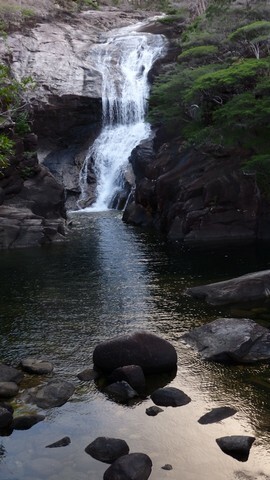 We partake in a morning swim at the Falls, before commencing the 2 klm rainforest walk out to Mulligan Bay. From here it’s a 5 klm march up the beach, thankfully on lowtide, to George Point to await the boat to Lucinda on the mainland. A rest to chase soldier crabs near the point, provides entertainment on the way. Of all the Queensland Great Walks, many have proposed the Thorsborne Trail as the finest – I’m happy to second that and carry the motion! 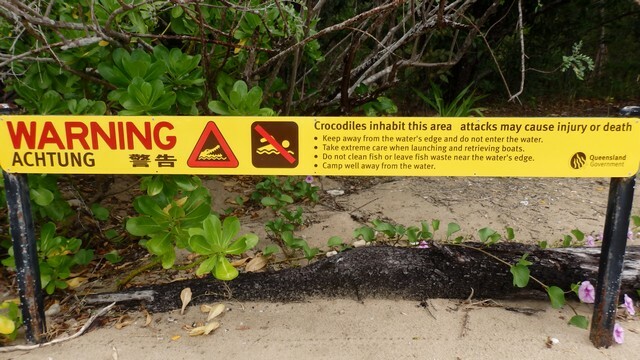 Just be mindful of the crocs and stingers and rats and mosquitos and sandflies and…. 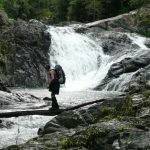 This entry was posted in Multi day hikes in Australia and New Zealand and tagged best bushwalks in queensland, best walks in queensland, Cyclone Yasi, Diamantina Creek, George Point, Hinchinbrook Island, Hinchinbrook Island walk, Mt Bowen, Mulligan Bay, Mulligan Falls, Nina Bay, Nina Peak, Queensland Great Walks, Queenslands best multi-day walks, Ramsay Bay, Sunken Reef Bay, Thorsborne Trail, Zoe Bay, Zoe Falls by danthewanderer. Bookmark the permalink.